Since Frederic Malle's Carnal Flower turned out to be so quiet and well behaved for a white floral, I thought I'd try a little shock therapy today. I'm wearing Olène by Diptyque, created by perfumer Serge Kalouguine and released in 1988. The notes are listed, not very helpfully, as wisteria and narcissus. Olène is probably the sort of fragrance that creates a white-floral-hater. The first 15 minutes are heady, to put it lightly: an explosion of honeysuckle, and not just any old honeysuckle, but a very sweet honeysuckle. On steroids. That calms gradually — you won't want to spray this on and walk right into an elevator full of innocent bystanders — into a lush blend of florals, with the wisteria and narcissus as promised, along with quite a bit of jasmine and a light musky base. It is best after about 30 minutes, when the sweetness of the top notes has faded somewhat and a light hint of green is evident. It has a kind of sultry quality that always reminds me of a hot summer night in the South, on a verandah perhaps, although if you were to really wear it on a hot summer night in the South it would probably send you to bed with a massive headache. It is best worn in the spring, when it has a nice sparkle that many white florals lack, and even then, it is somewhat easier to take when it is dabbed rather than sprayed. It is often compared to Jardin Blanc by Maître Parfumeur et Gantier, but I find Jardin Blanc rather heavy and flat in comparison. Diptyque Olène is available in 50 and 100 ml Eau de Toilette; the lasting power is more like an Eau de Parfum. For purchasing information, see the listing for Diptyque under Perfume Houses. I generally do not like white florals since they tend to trigger my migraines, but I love Olene. I ignored my sample vials of Olene that had arrived unwanted and unloved until the day that I accidently dabbed some of it on thinking that it was Opone instead. After the hot, heavy opening (which I perversely loved), it settled down into a beautiful green floral that lasted almost all day on me. I even dare to wear it on hot summer nights here in the South since springtime seems to last about 3 days here in SC before it gets hot. Olene makes me feel irrationally happy since it is completely “not me”! Interesting…I'm surprised that Olene doesn't bring on a migraine if other white florals do. I wonder why? It isn't like it is a light scent. But happy you found one you could wear…I think of white florals as “not me” also. Fracas was the first to convert me, and now I love many of them, but can't escape the feeling that they don't suit my personality. M, I have a feeling you would hate Olene…but you never know! R, Olène is sooo sweeet!!! I don´t think I´d ever bring myself to wearing this (but who knows…) though I don´t hate it at all. It´s just so overwhelming – it seems that a lot of floral fragrances get pretty heavy on my skin. Your comment on wearing it in the South made me laugh, because yes, Olene is bound to give you a massive headache in the Bombay level humidity and heat in many parts of the South. I used to like it, but now whenever I wear it, it strikes me as sharp and one dimensional. Jardin Blanc is the one I now like even less. A few years ago I was completely entralled with these two big, heady florals, but now I cannot wear them. Wow, Robin — this pretty much sounds like everything I hate in a fragrance (I think how you felt about the Borneo?!) — actually, if they threw in a really strong patchouli base, or some cumin, I could hate it a little more. The only one I've tried and looooved is L'eau Trois, which is certainly not on anyone else's list of favorites. If I want to get out of a meeting, just spritz this on before I go in, check. I really like white florals, so this may need some exploration. Can't deny that it is sweet, S! But better after it calms…and even then, not something I reach for very often. But in the right mood I love it. LOL — if they threw in some cumin or patchouli, I'd hate it too! I like L'Eau Trois too, and its cousin Virgilio, but those require an even rarer kind of mood. J, I read somewhere that it is one of their best sellers, but was very surprised to hear it as it is not widely loved on the fragrance boards….so you are not alone! I adore Olene, but it doesn't seem to last very long on my skin! It all but disappears after an hour and a half. I can't figure it out! 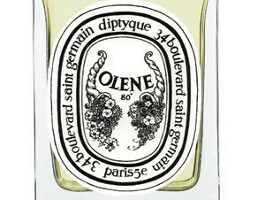 I am surprised, not all the Diptyques are long lasting on me but have no problem with Olene. Are you spraying it on? Yup! Liberally. I don't understand it — I've kept the bottle away from heat and sunlight. There's that first explosion and then about an hour of jasmine, and then nothing. It doesn't even leave much of a scent on my clothes. It's such a shame, because I'd love for it to linger on evenings. That is a shame then, it is not so short lived on me. Maybe try the MPG Jardin Blanc if you haven't yet, I think it was longer lasting. I will do, thanks for the tip! hmmm, I discover my sample o Oléne just now again, it is wisteria and a LOT of jasmin, if you spritz just a bit, then laundry, soap, clean, a tad of green, and the jamine tea pure. It lasts good on me, wonder how I came to it while looking for a Jasmin scent? !